I recently read an article online which asked readers to answer to a fairly intriguing question: Which real life character, living or dead, comes closest to Howard Roark from Ayn Rand's The Fountainhead. While not many readers had responded to that question, the basic premise of the question set me thinking. What should a person do, posses or perform to be worthy of this comparison? In other words, what is most distinct and respect worthy about Roark? Obviously, the answer has no right and wrong. As my father would smugly quote, "it is a matter of perspective." I believe that above all, Roark is a representation of unyielding, unflinching, uncompromising excellence. Nothing short of the best. "Total passion for the total height." What matters the most is that you put in all that you have, do the best you are capable of, and you accept nothing short of it. Roark represents this spirit perfectly, be it in architecture, in principle, in conduct or for that matter, even in expression. He holds immense respect for the human spirit, for the ability to create, to think, to produce. You are a function of your ability to think. And excellence is a product of your ability and your faith in it. Next, Roark is completely indifferent to public opinion. You hate him, fair enough. You love him, fair enough. You are indifferent to him, fair enough. What you think of Roark doesn't matter to Roark, quite simply because it is what YOU think of him. For him, his thought is worthy enough and sufficient enough.This brings forth one of the most popularly quoted dialogues of the book. Ellsworth Toohey asks Roark to speak what he thinks of him, assuring him that what he speaks shall be confidential. He is in for a rather rude shock when Roark replies by saying that he doesn't think of him at all. Furthermore, what is also characteristically Roark-ian is his objectivity and detachment. Throughout the book, Roark has often explained pain touching him only to a point, and then no further. He behooves detachment from circumstances and situations. His inner core is strong, safe and untouched. In other words, he is more than what circumstances force him to be, more than what situations make him to be; he is more than a sequence of events. Rather, he is a sphere of ideas, ideals, beliefs and values. So, do you know anyone in real life who personifies fiction's finest man? Or is he, as many speculate, too idealistic, without parallel in the real world? I have asked this to quite a few people since then. I have got answers ranging from Mark Zuckerberg (I couldn't personally disagree more!) to Severus Snape from the Harry Potter series (doesn't really count, Snape is an imaginary character himself). I also had a person suggest that she herself fits the bill while another interesting response was Ayn Rand. I personally feel that Roger Federer is a real life, everyday Roark. Why? 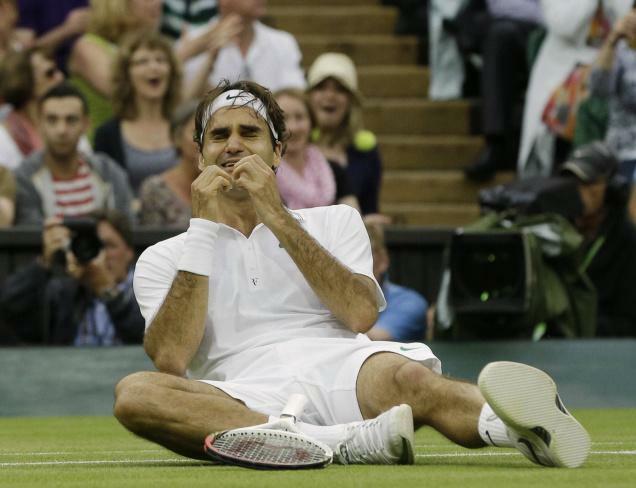 Federer has that same passion for excellence, for nothing short of the best. 'Total passion for the total height'? Absolutely. He plays in a league of his own, doesn't fret about what critics have to say and to me, he personifies excellence, quality, passion and integrity--all in the same breath. And he seems to hold great respect for mankind's potential and ability, to constantly improve and better, to hold infinite potential. He upholds the dignity of the human spirit through loss and through victory, through all that tennis throws at him. Upright but not uptight. And, there is this picture of his, after he won Wimbledon 2012. Somehow, in my mind, it is synonymous with Roark as he looks up to the sky (the picture Wynand likes so much) and also with the closing words of the book (...And there stood the outline of Howard Roark). The best though is that someday, on parameters as objective as these, I find myself worthy of this comparison.